How often do we hear the words spoken ‘’made in China goods are rubbish in quality’’? Such comments would generally appear to be true considering the flood of poorly made products exiting this East Asian nation. China is a nation that has over the last 20 years earned the reputation as the ‘world’s factory’. It goes without saying that many of our goods at home today are made in China, however does the reputation China made goods has earned really do it justice? I am a Sales executive at Tiny Tapir in Bangasar Village and it is not uncommon for customers to ask me almost on a daily basis where each and every product we sell is made. I do feel that the stigma of China made goods has spoiled it for many good quality China made products. An example of this are Zoobies. Zoobies are a wonderful 3 in 1 plush toy, pillow and blanket item for children that is made under strict guidelines from their US brand owner, however the product is made in China. The Zoobies product could easily pass for an item made in the US or any developed nation. As a Sales Executive many products pass my hands, also evaluating products to sell at the outlet is part of my job and truthfully speaking many products are made in China but their quality vary greatly. There are those products made in China that look like they are made in China, stuff that you’ll find at a Pasar Malam and there are those usually but not always Western Branded China goods made under strict supervision and requirements such as Zoobies. Let us not forget where our IPhones, IPads or Macs are made, Apple is an American brand but the product as a whole is assembled in China with many parts sourced from China as well, however the only that sets Apple apart from let’s say Xiaomi is that the brand Western. Yes of course we all know that the experience of an IPhone is far superior but it is still a China made product. Now let us not place western brands on a pedestal but there are some brands coming out of other parts of the world that have quality just as equivalent as western brands. Manufacturers throughout the world know very well that Asian and Western customers alike prefer buying Western brands hence some Asia brand owners/manufacturers have gone as far as setting up an office in a Western country to provide an image of brand credibility. It is sad that Asian brands have to go to this extent to prove their quality and avoid negative perception, in time we hope this attitude with erode and give way to a pride of ASEAN made goods. Only through time of consistent quality reinforcing itself into the psyche of people will perceptions change. Similar to the process of perceptions revamping that Korean car manufacturers are struggling with but in decades to come if quality and innovation is maintained Korean car manufacturers will be just as good as Japanese car manufacturers. Well at least we can hope. We at Tiny Tapir try to support small manufacturers. We believe that going local and ASEAN is the way forward, reducing our carbon footprint and reliance on foreign made goods. We aim to bring under our wing more and more ASEAN made goods and brands in the near future. In conclusion let us try to be more discerning when making decisions on China made goods and let us not blindly blanket all China goods under one general negative comment, for as we know there are different types of quality coming out of China. Secondly let’s try to support and give a helping hand to small manufacturers and ASEAN goods to break into the market. Together we can make a difference as consumers. If you are a cloth diapering mama or papa you are definitely feeling the water rationing effects very badly this month. 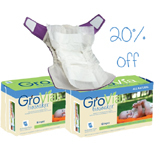 We may have a little relief for you with the GroVia Hybrid Biosoakers. Buy 2 this month and get 20% off. This will hopefully tide you over in those spots where clean cloth diapers are hard to come by until the rationing exercise ends on 31st March. Biosoakers are disposable inserts suitable for use with any PUL cloth diaper cover (GroVia shells, Thirsties covers, Flip covers etc) – just don’t use the sticky tab if you are using a diaper cover with exposed PUL inners (it will be harder to remove the sticky). Biosoakers are fragrance, dye, chlorine and plastic free with an ultra thin construction. They are made of 100% super soft Ingeo on-woven fibers which are renewable resource free of synthetic chemicals and preservatives. They are compostable! They also contain a minimal amount of SAP (a super absorbent polymer which absorbs a lot of liquid but also can absorb too much drying out your baby’s skin. It also releases that unique “disposable diaper smell” – a gas which is thought to contribute to childhood asthma). It’s not a very pleasant time to be in Malaysia right now, what with the water restrictions & the terrible haze. We can’t do much to ease the pain, but we are putting the Wrapsody Duo Water Wraps on sale. Or you can take a beach holiday on the East Coast and bring this wrap along to splish splash. Doesn’t this look nice? One of the best things – the wrap provides SPF-15 protection! Kiwi Pie Chickadee – 50% off! As we’re getting ready to release the new design of Kiwi Pie cloth diaper in Malaysia we have found ourselves with 6 lonely older style kiwi pie in the chickadee print. Just so we don’t mix up our stock – we’re letting them go below cost at 50% off. These are fantastic night time worthy diapers made of bamboo and lycra fabric. Super absorbent, perfectly stretchy, they are a big crowd favorite among the fitted diaper crowds. .. why not check out some gorgeously smelly Dirt Candles for the festive season? We only have a few of these left. Why do we love them?